TuckerThe skin is the body's largest protective organ; it defends the inner structures of the body from the outside environment. Although it consists of many layers and is tough and resilient, if the skin is compromised too much, the dog's health is at risk. One of the most common problems affecting the dog's skin is skin allergies, many of which are caused by hypersensitivity to environmental allergens or food allergens. The heat of summer makes these allergic reactions worse and your dog may develop "hot spots" or moist dermatitis. 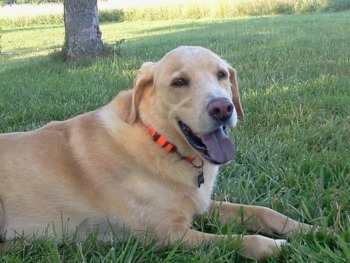 A dog that itches, scratches or licks himself excessively may result in the eventual forming of a wet scab on the fur. Dogs that have matted and dirty coats are more susceptible to a bacterial infection. Other dogs could have patches of dry itchy skin they will rub raw that can also become infected. If either of these symptoms present in your dog, use Essential Immune along with Allergic Skin Reaction to take care of the infectious aspect while addressing the skin reaction. The therapeutic actions of the herbs in this formula are directed to the skin and the deeper tissue just under the skin. They relieve the redness and painful swelling of sores and rashes, stop the formation of pus, speed recovery and clear the dead tissue associated with rashes and sores. This herbal solution reduces itching by soothing the skin and stopping the allergic reactions. It also moistens skin dryness to relieve that component. Ingredients: chan tui, niu bang zi within a proprietary blend. 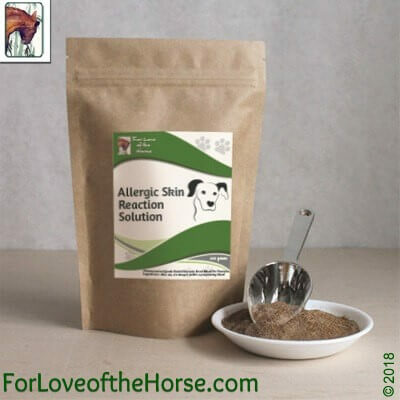 Allergic Skin Reaction for Dogs 332g Discounts Apply !